I was inspired by the hat worn by Mary J. Blige on the cover of her "Reflections" album. Her hat was apparently knitted, but since I don't knit well, I decided to try one in crochet. This is the result, in cotton yarn. My daughter, Cambria has claimed this one, but I've had requests for more. The pattern is in the works, which I'll hopefully be selling on Etsy and Lulu. Silly me! I was a bit worried when I was looking at your post for the crochet handles this morning (a friend knew I was interested in those and sent me your link) but I thought your last post was in July! I see now I was wrong. I LOVE your hats! I, too, am on Ravelry. Do you sell your patterns there, or just on Etsy? You can find me on Ravelry as SaudiStitcher. I've either bought hooks with handles or added the handles to almost all my hooks. The only ones that don't have handles are those I don't use. 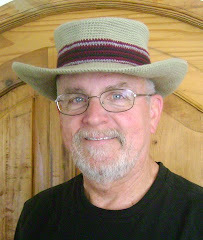 Thanks for the nice comments about my hats, too! crochetDad, your designs are lovely!!! greetings from argentina! That's superb. I'd love to buy one for my girly girfriend. Would be lovely to see such unique items on a eShop. Any idea where I could find such items online ?